MANILA, Philippines – The Gilas Pilipinas Cadets proved that the Philippines is still the kings of courts in Southeast Asia by beating Team Indonesia at the SEA Games Men’s Basketball finals, 72-64 on June 15 at the OCBC Arena in Singapore. FACT: Every Southeast Asian country wants a piece of our Basketball Team. The hard-working Thais and relentless Indonesians pushed our Nationals to their limits to the point of almost snatching the title from the ASEAN power house. 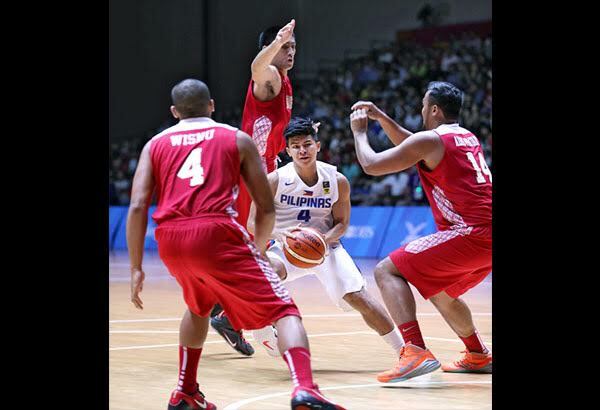 We cannot say that our Gilas Cadets showed a poor performance in the semis and championship games. They surely played with all their hearts out. It’s just: 1. They’re too young; 2. They lack professional and international experiences and; 3. They lack cohesion compared to other ASEAN Teams who are mainstays in the ASEAN Basketball League (ABL). For Filipino-Indonesian baller, Ebrahim “Biboy” Lopez Enguio, earning a silver medal is tantamount to winning the championships for getting into the cadets’ nerves for 4 nail-biting quarters and almost had the chance of dethroning them. Enguio, whose father is Indonesian and whose mother is a Filipina played for the UE Warriors and balled against some of the Sinag players during his collegiate days. He admitted that the Philippine squad is really a force to reckon with but extremely happy with the end game result. With these statements, it is very clear that no one’s scared of Philippines anymore. "Our amateurs are very, very good basketball players," Coach Tab Baldwin emphasized at the presscon. "But these professionals that are playing in the ABL (ASEAN Basketball League) and other countries are catching up." Let the semi-finals game against Thailand and championship match-up versus Indonesia served as a wake-up call for the Samahang Baskebol ng Pilipinas (SBP) and other sport governing body of the country to take SEA tournaments more seriously to avoid total melt down. Philippines along with SBP should stop sending amateur players and start commissioning professional players to all international competitions in order for us to solidify our basketball supremacy in Southeast Asia and entire Asian Region. Lee Sang Min, who broke filipinos’ hearts way back in 2002 at the Busan Asian Games basketball semis against our very own National Squad is currently in town to support his compatriot, Barangay Ginebra Asian import Jiwan Kim said in an interview that Philippines has all the tools to rule Asian basketball once again based on Gilas’ recent achievement at the FIBA Asia Championship couple of years ago where we finished 2nd after Iran. ASEAN Basketball Teams are pretty much aware that the Philippine team that they played against is just comprised of college and amateur players. Because of this, they had established a solid mindset that Philippines is not invincible. SBP in my own opinion should also start looking for another dominant-big man whom we can naturalize like Marcus Douthit and Andray Blatche. It is undeniable that Douthit has helped our National Team in bringing back its long lost glory in the Asian and world scene. We will be forever grateful to our Kuya Marcus. But, he’s not getting any younger now. At 35 years old, his skills and talents are slowly diminishing and has been plagued with various injuries. It showed at the SEA Games. He got slower in all ends of the court especially in scoring. We can’t purely rely on Andray Blatche’s services in all tournaments that we’ll play at due to prior commitments abroad. Blatche is currently under contract with Xinjang Flying Tigers in Chinese Basketball Association (CBA). Good thing that the 27 year old NBA veteran gave his word to Coach Tab Baldwin and basketball godfather Manny Pangilinan that he will surely be available for the next FIBA Asia tournament. Alaska Aces owner Wilfred Uytengsu expressed his sympathy on the present situation of our Men’s National Basketball Team. Uytengsu encourages the commissioner and governors to shorten the PBA season to just 2 conferences to spare the players especially the Gilas pool from wear and tear due to almost 10 months of basketball schedule and have an ample time to prepare for international completions like Jones Cup and FIBA Asia World Cup Qualifiers.